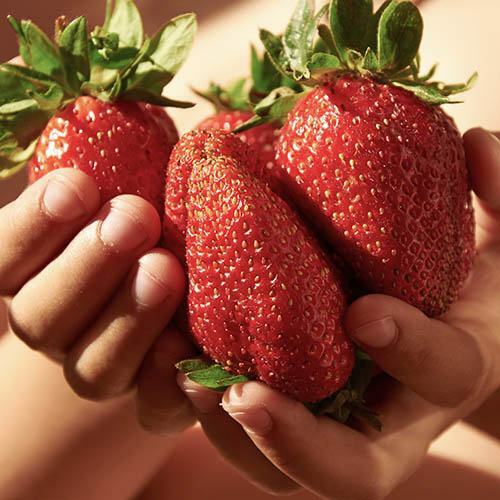 Grow your own strawberries - even without a garden. If you love strawberries but think that you don't have the space to grow them, then your worries are over! The delicious way to one of your five-a-day, strawberries are easily grown in a hanging basket! This easy solution will provide you with plentiful pickings of fresh fruit over several weeks, all from a height and position convenient to you. A great way to get kids interested and learning about gardening. Contains 6 plants in total, established and growing in 2 x 27cm (11in) orange plastic hanging pots, so you only need to hang them up where they are to fruit. If you love strawberries, but just don't have the space to grow them, then this is the ideal solution! Simply delicious, strawberries are really easy to grow and make great candidates for growing in pots and baskets, and this practical solution will provide you with plentiful pickings of delicious, juicy strawberries over several weeks, all from a height and position convenient to you. An ideal way to get the kids interested in gardening and learning about how fruit grows, plus the vibrant planters make a fun way to grow these summer favourites. We have planted a pair of vibrant baskets with 3 plants in each of the highly productive variety, ‘Sweet Colossus’ strawberry - a traditional strawberry with sweet and juicy, conical berries that often weigh more than 40g each - in fact the massive berries produced from this stunning new variety could be the largest strawberries ever and unlike some other 'king-sized' fruits, they are simply bursting with flavour too. As well as taking full advantage of small spaces, by growing your strawberries in a basket you'll find them much easier to reach and maintain - plus the compact harvest area means that they stay dry and don't get muddy, plus they're much easier to protect from birds. We supply six plants of ‘Sweet Colossus’ established and growing in 2 x 27cm (11in) orange plastic hanging pot. Supplied as 6 plants of ‘Sweet Colossus’ established and growing in 2 x 27cm (11in) orange plastic hanging pots. Hanging basket strawberry plants need a good six to eight hours of full sun a day for optimal fruit production, so hang your basket somewhere sunny. Strawberry baskets should be watered daily and will need regular feeding (once a month until blooming) due to the limited amount of nutrients in the pot. Feed your hanging strawberry pot at least once a month until flowering and then every ten days with a liquid feed that is high in potassium and low in nitrogen.